I wrote last night ... I was too tired to add the pictures and publish it ... when I woke up this morning, I re-read it and realized it wasn't something I should publish here. I added it to my private blog. I couldn't delete it totally because it was how I felt and I just needed to get it out. However; it made me realize a few things... it is not news to anyone I know that I have been very sad for a long time... I wear my my heart on my sleeve. I don't know how to compartmentalize that part of myself, not that I didn't try because when I was numbing myself by zoning out of my life that was my effort to hide my sadness. That didn't work out for me so well, instead it built up more and I tried numbing it more. I ignored everything, I would come home, veg in front of the TV then go on the computer, then sleep. Anytime I thought about the sadness that was threatening to engulf me at any moment ... I dove into anything and everything that would cover the sadness. It didn't work though as it rarely does, what it does instead, it ends up destroying me. I don't know about other people, I just know about me and whenever I bury something, it comes back stronger. I was angry at 'him' for a number of reasons that I won't go into here... I do wish I could have said the words I had inside to him, he needs to know... but then I don't think he would own the truths, instead he'd lay more blame outside of himself, probably on me. I actually took the blame he laid on me at first but as time went on, I realized he was afraid of what I knew and what I could say. This proved he never really knew me and it took me a long time to accept that... because if he had really known me, he would have known that I would never ever do anything to hurt him... even though he had hurt me more than I ever thought possible. I let go of the anger before the New Year... I didn't want to bring it with me, the sadness is slowly going away. It's because I am changing my life, this year is really about 'No Excuses' for me. I rarely miss a day of exercise, if I cannot walk because of nasty weather, I have danced and I am continually looking for alternatives. I want to be successful, so I am thinking outside the box daily. I cleaned and organized my home a bit more, little by little I am going to be ready to move and really make a new start by downsizing to absolute necessities. The more things I have, the more clutter I have... the less peace I have. I am making and keeping plans with friends, there is a dance this weekend coming up and I am going, I even have a little black dress for it (my first one). I plan to just have fun and dance with my girlfriends... As well I have made commitments to have people over and just talk... I think with the internet we lost that ability for small chat... I miss that. I am giving up the idea that there are limitations on where I am and what I am able to achieve, if I decide to make a change and really put my mind to it, I am capable of achieving it ... it will take work but I am not afraid of putting in the hard work... I would be more afraid of not putting myself out there and conquering the trials that have been given to me... that would mean I was going backwards and not growing. That is unacceptable to me... For today and going forward it is full steam ahead and 'No More Excuses'. Listen dear. I know one good exercise! Every day you need to write three A4 format sheets of paper about all your feelings and don't read it. Do it for a weeks, month and just after that you can read. It helps to realize what are you worrying about and maybe you'll find the way how to solve it! Just 3 sheets of paper with your feelings and emotions every day! I know I'm always full of sayings, but these little quotes have always helped me with things like that. I believe forgiveness is the best gift you can give yourself. It just FEELS like the other person benefits when you forgive. Really you're the only one who benefits. Please be kind and give yourself a break. Like Stephanie is saying here forgiveness is the best gift you can give yourself. You have given us all a lot of inspirations through your writing. You have given some of us strength to deal with our hardships, now you have to shower yourself with compassion as well. Also remember that we are all here for you. Just let us be there for you. I'm excited about your weekend coming up and being with friends. Yes, I think a lot of us miss those days of getting folks together just for a chat. I'm glad you are nourishing those friendships. Thank you for the little reminders of your reflections. I think you are helping all of us. I know I'm hanging on to way too many things myself. Like the song says.."Let it go.."
Launna, I am so very happy to know that; you have been doing everything you can, or you should- to make yourself happy. But don't just do it- enjoy doing it- and this way you will have able to let you 'negative' emotions know that;" you have started taking control of your life, and you will do everything to make yourself a better beautiful new you. You are strong! Do not give up any day. So excited about your weekend party. Parties with girlfriends are so very best!! I love it!! Love your quotes and thoughts. Keeping our thoughts around positive outcomes helps to overcome the sadness over a period of time. I know, It's easy to say than done, but if we start practicing it slowly, it will become habit in us. I wish you could conquer this, Launna. You are so strong, Launna. I love that giving up is not an option anymore. Have fun at the party! This is such an honest and lovely post.. Have an awesome new week! Burying sadness and anger definitely isn't the way it works for me too. It would backfire and like you, come back stronger. When upset, I would cry loads. Like really cry for days depends on the severity. Of coz I don't cry 24/7. There would be times when I'm ok and when the emotion comes back, the floodgates open. Talking to friends about it also helps. In times of anger, I find that bitching out loud also helps to get all the negativity and steam outta your system. And you know, typing everything out also helps. It's like unleashing whatever inside out out somewhere. Like what you just did. Just typing out and of course if it isn't suitable to post, at least keep it private somewhere. I think for a start, these would help to get all the bad energy outta your system. As for exercising. Sometimes I would play dance music from Youtube and simply shake and groove my way through in my room or bathroom before showering. It is good fun exercise just before bath. I'm not too sure if you're keen on trying that on days of nasty weather. I'm glad to hear that you have a gathering with your gal friends and that you would be dancing. I think that's physically, mentally and socially healthy. You can do it Launna! :-) I believe in you always! You're such a good person. Going forward really is the best and only option. I hope you have fun at the dance! Great positive attitude...keep moving forward. All the best! 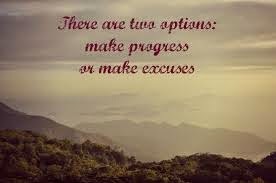 YES, NO MORE EXCUSES!! This is such an inspiring post Launna. Thank you so much! For the past weeks I've been finding excuses to not work on my practicum. I know I'll cram again because of that but really, thanks a lot for the inspiration and for the motivation/ for pushing me to really start working now. hehe. Have a great week dear and God bless! Wishing you all the best and a happy week. It sounds like you're still making progress, and you're right about moving forward. Will Rogers said something like this: "Even if you're on the right track, the train could run over you if you just sit there." I hope you have a wonderful time at the party Launna you deserve to have fun. I'm so glad to hear you are are letting go and I totally believe that forgiveness helps you more than the other person. Hope you have a wonderful start of the week and let's hope the snow stops. Hi Launna. First of all, I am so so happy that you've finally decided to take that risk. I am with you. Sometimes, it is necessary. If something is making you unhappy, time to let it go. (Be it a person, or a job!). So, just don't worry. Trust your instincts, and just go for it!! I am with you!! In fact, I am in the same boat!! :) And now, coming back to this post of yours, you should totally wear that black dress and go for that dance, dear!! As you said, this year is an year for no excuse. So there is no excuse to not go for the dance :) You're a strong woman, Launna! And it wasn't easily to completely forget and forgive that guy, but you did. And that defines who you are!! :) He has clearly lost a diamond. Joke's on him! First of all, Launna dear you are a strong woman and I'm sure you'll move on. I admire the fact that you pen down your emotions which is very difficult for me to do. If it helps, I have heard people writing down their feelings in a paper and then throwing it away. Its a symbolic way of throwing away all those bad thoughts you have in mind. Second of all, I'm glad that you exercise in winter as well... I for one wouldn't get out of my bed during bad weather. Lastly, Do enjoy your party with friends. You deserve it all!! I totally get why you have a 'private' blog where you can write these things... but maybe, just maybe it would be good for you to let it out on here. You know we would all support you. Although look at me... I'm just an anonymous no body with serious love and relationship dilemmas! Cleaning when you're upset is always a great thing to do. I wash dishes, spring-clean, throw out old clothes.. anything to just get some weight off my shoulders. We're all here for you - I always am anyway. Dear Launna, I always tell you that you are stronger than you believe. You're on the right way, you will overcome him and everything. I simply like the way you are because you are such a strong women. That's the greatest asset that most of us miss. There can be no going back, only forward and to live in the past is fruitless and only causes harm. You didn't deserve to be in that prison and I am glad you're taking positive steps to freeing yourself. You're saving yourself, being your own kind I hero and that is incredibly commendable. You know I only wish good things for you my dear friend and I hope you can continue down this road and should you ever need rest or a shoulder to cry on I am always here. Sadly only on this medium. I do wish I could come around and talk to you face to face though. I'm beginning to miss human interaction myself and I think like snail mail this is a way of life that is slowly getting lost, which is a terrible tragedy. I'm sure, my dear Launna, you'll move on because your are so strong, stronger than you believe!!!! I hope you have a great time at the party!!!! I too don't believe in making excuses, definitely excuses are meant for those people whose will-power isn't strong enough to achieve the target. Making progress is always far better then excuses and my dear Launna you are blessed with a strong will power so you will definitely achieve what you want and as I never saw you relying on excuses. I agree whit people that say to you that you are very strong! I'm sure that you're going to move on and be ready for that! Amiga passando para ti deseja tenha uma semana abençoada. so proud of you sweety! stay strong and have a wonderful new week! Cleaning out and organizing your home is so stressful but also so rewarding! I love when we dedicate a day to it, I feel so much better when it is complete! Good luck!! Full steam ahead, and no going back - very well said. The only way to truly accomplish something, we have to go THROUGH it - there's no way to go around our problems, or ignore them. But that's easier said than done sometimes! I applaud your strength and courage. Have a wonderful week! Well, dear Luanna I think you had the strong and power to overcome that moment in yourself since the start, but you needed to wait until the right moment so that you can full understand the resons behind and find the confidence to put them in action! Honey there aren´t any limitations for you!!!!!! Not one!!! I know that you already fought out of all that sadness. He really never knew you I guess. Maybe he will regret what happened, but when that happens, you are stronger than before. All of your exercise, walking or dancing really pushes you foward and makes you even stronger. There aren´t any excuses for you anymore, that a kind of strenght you´ve learned by all thaht happened!! 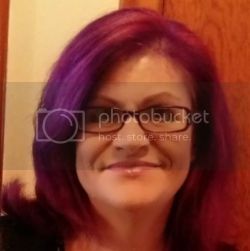 Launna - heartfelt post - " For today and going forward it is full steam ahead and 'No More Excuses'." Your 2015 journey continues and there will be ups and downs but keep strong. que tudo na sua vai ser o que você almeja. Very wise words! 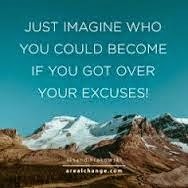 It feels so comfortable to just lay back and let our excuses paralyse us, but this way we won't ever get anywhere... You're doing an amazing job and you can be really proud of yourself! Go girl! You also have to remember all that you've overcome and accomplished through sadness. Keep on movin'. In relation to your last comment- yea, change can be so hard and frustrating. IT is also wayyyy easier to say, "we much embrace and adapt for growth," than it is to apply. Isn't that the truth! I'm so sorry for your current sorrow girl. I'd say stay strong, but first, pamper yourself. Maybe make some hot coco and enjoy you! <3 Stay strong and I'll pray for you. I look forward to your next visit on my bloggie too! I'm happy you are going to the dance and your sadness is slowing going away. I can't wait to see your dress. have a great day. I have a suggestion! I know you like to walk and that the weather doesn't always co-operate. I found a series on YouTube called Walk at Home. They are awesome. They range from 5 minutes to 45 minutes and they really do help with the energy and will lift your spirits. I still hope you get a Fitbit -- it is fun to watch those numbers and they do motivate you to move more. Every step counts! Hop you have a great week. Hugs! You're a strong and wonderful woman, we're here cheering you on for happy looking days! I think we all need a push forward on the hard days. Oh my darling Launna. I want to give you a hug and telling you from the bottom of my heart that what you have been through is already tough but sometimes being strong means being able to cry and sometimes moving on means being strong enough to let go. My caring and kind words to you to support you to walk through your hardest time I feels for you "Launna, take all the time you need to heal emotionally, moving on doesn't take a day which we all know but it takes a lot of little steps to be able to break free of your broken self. Life is about moving on, accepting changes and looking forward to what makes us stronger which what you're doing now. We cry not because we're weak it's becuase weve been strong for too long. There are far better things ahead than any we leave behind. My dad has always tell me when you finally let go of the past something better comes along and he's right about that and I am strongly agree with him. Just keep moving forward. The only thing harder than leting go is moving on. Have a fun dance night with all the girls and then invite them to have some chit chat like nothing happening in life just joy:). Make yourself beautiful like is the last dance of your life my wonderful Launna. Will talk more about the move:). Have to out the boys in bed:). Uncluttering your home, and living simply is the best! I'm glad that you are finding strength and courage to be and do what you want. Go out and do it full force, leave the past negativity behind, and focus on the good people in your life. You deserve happiness, and I'm sure you will find it doing the things that make you feel good. Keep on moving forward and don't look back! Writing things down- even just for yourself - is so good and helps really puts things in perspective. Glad you continue to move forward and stay positive! Hi Launna. I just came over to say hello and see how you're doing. Hurrah for your first little black dress! Now that you've mentioned it, I don't think I've ever gotten one either...I'm overdue. :) I hope you have a wonderful time dancing and visiting! oH Launna dear, I don't know what to say to you as a younger fellow to you but honestly, I just wanted to hug you. You have more wisdom than me so I guess I can't comfort you with my amature words or sometimes words ain;t really enough to show care but I do. Thank you for always wishing good on my blog and for my baby dog. I appreciate so much! Ciao m y sweet Launna, happy wed! Clutter definitely leads to depression. I think that's one aspect I've loved about my new home: there's actually a place to put everything. (Not that we have a ton of stuff...) This transition is going to be a good one. Fresh start, fresh patterns, fresh perspective. Launna, this is such an inspirational post, thank you so much for sharing. This was very inspiring post with many great quotes. A while ago I found one that really made me think and would like to shar it with all of you: ''The winners have faild more times than the loosers have even tried!" Ciao carissima Launna, sono felice di leggerti! I tuoi post sono molto belli, very beautiful! My dear Launna, I'm so sorry to hear that you've been through difficult days, I really hope things are getting better now. They will, soon or later, because you deserve it. You know, when you said that you wish you could've told him the words you had inside, I felt totally related to that regarding a very sad situation I've experienced. But once I thought that maybe with the time that person would realize by his own his mistakes. You probably won't have to tell him anything at all, 'cause life itself would show him the consequences of his actions. I hope you can understand what I mean. I don't have a point of reference Launna. I wish I had words of comfort, but I don't. I think you are a strong woman. I've read it in your writing since I've been following you. I think that strength will see you through. Thank you sooo much Launna for your ever super sweet comments!! I love you as well!! You're such an amazing person, and you've got absolutely no idea how much your comments make me smile!! :) Thank you so much! And the valentines post was a rant for those annoying ladies i see at work. They're so lame! I am just glad Im out of that place! Hahaha! And the fact that valentines falls on a saturday makes it even more sad for them :p They missed their only opportunity to flaunt their "relationship". I am doing a look daily for different ideas for Valentine's Day dinner date looks btw. You always write wise words. I edited my last post and I wrote in the end your first sentence. Have a great day dear! My dear launna im so sorry to hear you havee been thought difficult days , but i belive that launna who i know is a strong women. Women who always tried to stand up after down and smile after crying. And it was showed, what i thought is true my dear launna better now. She star to move again, doing fun times with friends. Ya launna sometime a little chat change Our mood. Make us more intimate and care each other. We have 2 world that must blance between iternet world and real life. Here you found there were so many people care, pray and support on you. That should be your motivate to thankfull to god for the bless and experience your life with doing all made you happy. Forgetting all sadness. Suggestion, doing game that include body movement like sport together with family and friends. It can make you happy , healty, fresh and more close with lovely people around you. You haven't update your blog for about a week. How are you now? Hi Launna I hope your doing well, nice quote! Although I am not moving, I have been downsizing. It feels great to get rid of what is broken and donate the rest. guilty one here. for the past years it has been my weakness well until now i hope ill get over it hopefully. You have a great writing skills..I loved the blog. Glad i discovered your blog. Ciao Launna, I Wish you a Lovely day!!! OOOH! What kind of dance?! Nice, I agree with you 101%. I grew up by this simple word: discipline, it makes your life so much better! This hits right home, Launna. I tok hate it when someone I'm trying to help makes excuses rather than work on it. 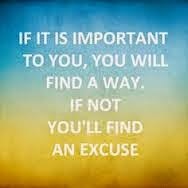 At the same time, I hate myseld when I find excuses when I need to get something done. Thanks for being so honest all the time. happy valentine's day dear Lauanna! Its always best to move through the hurt and keep on moving. It won't go away overnight, it will eventually dissipate so you can love again. Be mindful though of the lessons as every relationship comes with them. I found it easier to manuever life and its challenges no matter the course to remember my worth, the value I bring to every opportunity/situation. It helps to stay my course and ensure I am not used and abused. I set the standard for how I will be treated and will be willing to work away even when my heart says the contrary. I found it essential to honoring myself, my heart, my soul, my spirit because without those, I am an empty shell of vast nothingness and that is not to my benefit. Keep strong and honor yourself in all things in all ways and you will always be like air and rise. Happy Valentines Day! Wishing you a warm time with friends and family!